Tim Shakespeare of Healing Wave Chiropractic, in NSW, was once a board member of the Chiropractors’ Association of Australia NSW chapter. 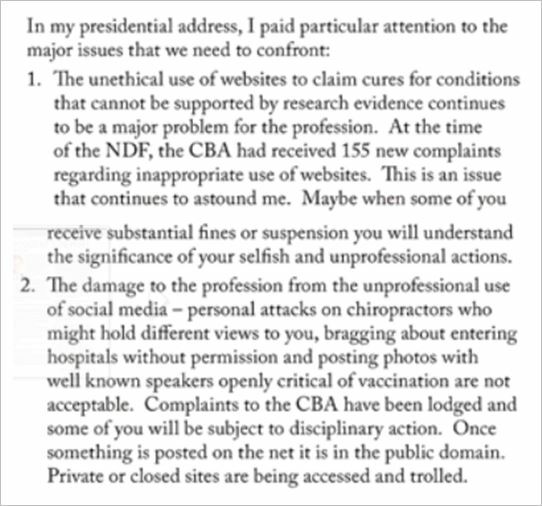 That was until the CAA NSW took proper notice of his arrogant public anti-vaccinationism, and his bragging about secretly entering public hospitals to perform his voodoo without the permission of any treating practitioners or other hospital staff. Because vaccines are exactly the same as heroin. 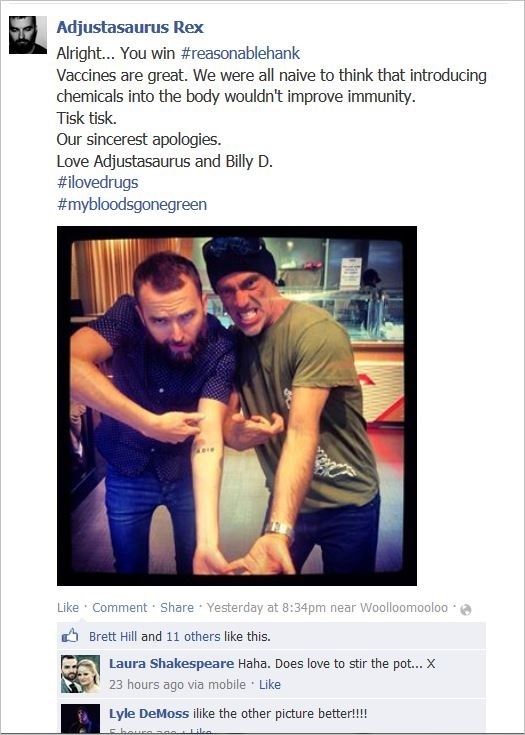 “Brett Hill…likes this”. “Blogosaurus”. Oooookay. I’m saying nothing. I know what you’re all thinking. Billy DeMoss has also recently hosted CAA luminaries such as Jennifer and Simon Floreani (pictured with Andrew Wakefield), and Laurence Tham. I’m wondering when President Tassell’s words of warning will ever ring true? I’d love to watch the talk, but, I’m not paying money. Maybe the CAA will watch it, and then act in accordance with its previous threats. It hasn’t yet. In the meantime, CHIROPRACTORS REPRESENT! 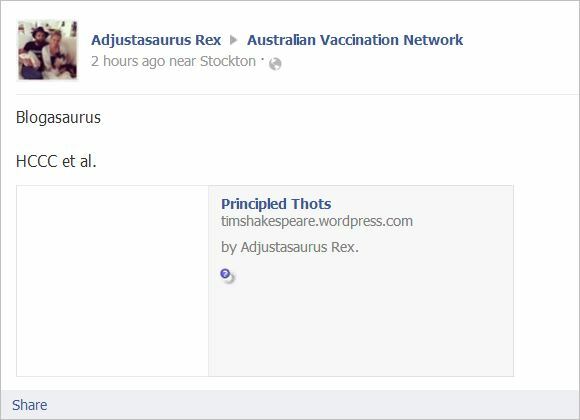 This entry was posted in anti-vaccination dishonesty, australian vaccination network, AVN, chiropractic, skeptic, stop the australian vaccination network and tagged anti vaccination, Australian Vaccination Skeptics Network, AVN, AVsN, Billy DeMoss, CAA, CAA NSW, Chiropractic Board of Australia, Chiropractors' Association of Australia, Chiropractors' Association of Australia New South Wales, Dead Chiropractic Society, Healing Wave Chiropractic, Jennifer Barham-Floreani, Laurence Tham, Laurie Tassell, meryl dorey, Simon Floreani, Tim O'Shea, Tim Shakespeare. Bookmark the permalink. Thank you Tim, Billy, Jen, Simon F, etc for taking your colleagues, and an entire profession, which has fought hard for credibility, a place as experts in non surgical spine and nervous system care and members of a wider health care industry and throwing it out the door to suit your narrow minded, quasi religious and juvenile conspiracy theories. If you read this – and I hope you do – remind yourself that there are a great many in this profession who despise the self serving salesmanship which has passed for ethics in recent years and the equally vapid misunderstanding of the role of scientific research. Rational Chiros – come out publicly and strongly against the renegades! Hank’s blog is popular but it won’t get you to the general public. Thanks Sue. This is part of that process. For example I chose not to rejoin the CAA because the attitude is to ‘work together’ in response to political medical opposition to our profession and I understand that. Political medicine has a track record of stepping on toes not just with us but even with pharmacy (something we find difficult to accept, we like to feel set upon, it’s become a theme). My position is simply that we are ethically wrong. Political medicine may continue to marginalise for economic reasons but their beef is ethical. We refuse to admit that due to our choice to base ourselves upon ‘vitalism’ (which is a faith), we defuse rational scientific enquiry, permit and nurture the spread of unsubstantiated practices and opinions and lie to the public. We damage our own clinical expert skills and it’s like watching a drowning man refuse a lifejacket. The CAA refuses to stand up to unethical practices because it is primarily composed of supporters of the same. I used to allow it as well in that “oh well, they’re not hurting anyone” soft headed way, and that’s true – most are well meaning (some work tirelessly to defend my livelihood), but in truth we are lying to people for no other reason than we can’t be bothered to think. We’re too afraid to take the skeletons out of their closets. I mean some of the claims out there are extraordinary and well patronised. The worst effect is on the capacity of chiropractors to diagnose or read and understand what good research is. It’s appalling. We deserve the boot. Another organisation – COCA – has a different attitude. They respect rational standards. 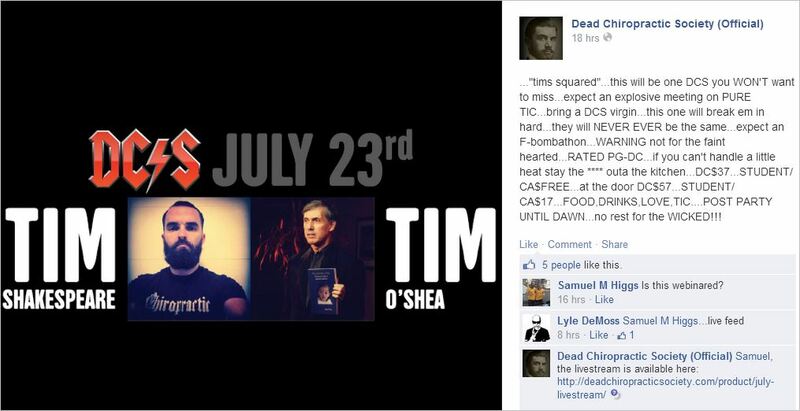 But the promotion of the DCS event is so professional. What could you possibly be concerned about!?! Haha, an IV pertussis vaccine. The guy is clearly an expert.